Grouper, or cods are among the most commercially important marine food fish in the Southeast Asia. They are one of the most expensive fish species and are valued for the excellent texture and flavor of its flesh, as well as its great potential in aquaculture. They are farmed commercially in brackish water fishpond and net cages. The fish grow fast and attain marketable size of about 500-600 g body weight in 6-8 months of culture depending on the environmental conditions and farm management skills employed. 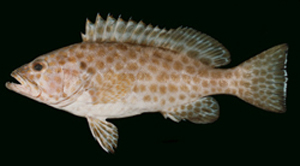 The grouper industry around the world is developing rapidly mainly due to its export potential. However, its growth and development is constrained by the lack of seeds supply and trash fish feed. In India except for some experimental farms in Mandapam, grouper farming has not expanded much. However, owing to its large export market and potential as a possible aquaculture candidate grouper farming attracts much interest. There are about 40 species of groupers distributed in tropical waters but only species are currently popularly cultured commercially. These are Epinephelus coioides (Orange-spotted estuary cod), Epinephelus malabaricus (Black-spotted cod), Epinephelus areolotus (Areolate cod), Epinephelus tauvina (Greasy or green cod). The hatchery production of grouper is still at infancy. Limited success has been achieved on seed production of E. malabaricus through administration of Human Chorionic Gonadotropin (HCG) and hypophysation. The post larvae are fed with oyster trochophore larvae and later with rotifers, nauplii of brine shrimp and mysids. However, the present level of farming involves collection of grouper fry from the wild and rearing them in net cages. Grouper fry are collected from tidal rivers, estuaries and coastal bays. Their availability is seasonally although in some areas, grouper juveniles are available all year round, with a peak in November to June. Tiny groupers measuring 2-3 cm body length abound in estuarine areas particularly near mouth of tidal rivers during spawning season. The fry can be collected by a fish trap net set at the mouth of the river as they are carried by tidal currents toward the shore. Grouper fingerlings measuring 5-12 cm length can be caught by baited hook and line, bamboo trap and dip net. They are also gathered in nominal quantities using various devices, e.g. scare-lines or brush piles.